On Saturday 1st September the region’s biggest bus operator will transport passengers back in time on the 10 and 10A routes, by running a variety of classic vehicles including a 1954 Birmingham City Transport Daimler; a 1986 blue and gold Timesaver Metrobus; and a 1998 Optare Spectra – the first low-floor double decker in the country. “We’re really pleased that our new 10A service has been going well as we know local people want reliable, frequent bus travel to and from Lichfield and Walsall. 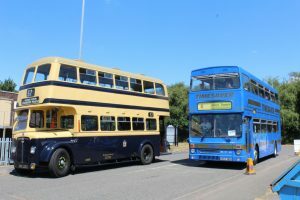 The National Express 2018 Birmingham Pride bus, Coventry heritage bus and the Walsall Corporation liveried Trident will also make an appearance, along with some other surprise heritage visitor vehicles. On Sunday 22nd July 2018, National Express West Midlands’ 10A route was extended to serve Lichfield bus station from Walsall, Rushall, Brownhills, Chasetown and Burntwood, seven days a week. The 10A runs up to every 30 minutes Monday to Saturday and up to every 60 minutes on Sundays. Crucially, it means that National Express is providing a much needed Sunday service to Lichfield following the complete withdrawal of bus services in April this year. To mark the last day of operation of the 300 series route numbers in Walsall this weekend, the bus operator will also be running duplicate journeys on the 301 between Walsall and Bloxwich with its older vehicles. From Sunday 2nd September, the 301 and 302 will become the 31 and 32 as part of a joint partnership operation with Diamond buses. Passengers can travel for free on heritage vehicles operating on the 10, 10A and 301 routes this Saturday. Normal adult and child fares will apply on ordinary scheduled journeys operated by National Express West Midlands’ different liveried modern buses. Any money raised from voluntary passenger donations during the day will be passed on to the Midland Freewheelers Blood Bikers charity, which is one of one of the charities that National Express has partnered with this year. Midland Freewheelers Blood Bikers is staffed entirely by volunteers that give up their time to provide a vital emergency out of hours blood and medical essentials delivery service to NHS facilities every single day, 24 hours a day.